The IMaX instrument on the SUNRISE telescope not only depicts the solar surface, it also makes magnetic fields visible; these appear as black or white structures in the polarised light. 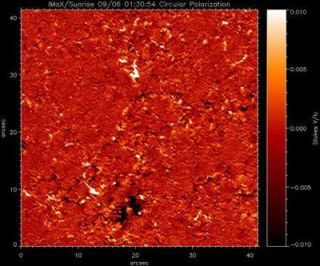 The bubbling, roiling surface of the sun has been imaged inunprecedented detail, shedding light on the processes at work on the solarsurface. Images of transient darkspots, the sun's seemingly granulated texture and moving packets of gaswere snapped by the SUNRISEballoon-borne telescope. SUNRISE, the largest solar telescope ever to have left Earthwas launched from the ESRANGE Space Centre in Kiruna, northern Sweden, on June 8. The 6-ton telescope is dangling from a gigantic helium balloon with adiameter of 427 feet (130 meters). After launch, SUNRISE reached a cruising altitude of 37 kmabove the Earth's surface. At this height, the telescope is in a layer of theEarth's atmosphere (the stratosphere) with observing conditions similar tothose from space. Air turbulence isn't a factor for SUNRISE as it is fortelescopes on the ground, and ultraviolet light from the sun can be viewed,which would be blocked out by ozone at the surface. During its five-day flight, SUNRISE gathered 1.8 terabytesof observation data. Scientists have only just begun analyzing the data, thoughthe first findings are already promising. Of particular interest to astronomers is the connectionbetween the strength of the sun'smagnetic field and the brightness of tiny magnetic structures on itssurface. Since the magnetic field varies in an 11-yearcycle of activity, the increased presence of these foundational elementsbrings a rise in overall solar brightness, resulting in greater heat input tothe Earth. The variations in solar radiation are particularlypronounced in ultraviolet light. During its stratospheric flight, SUNRISE carried out the first-ever study of the bright magnetic structures on the solarsurface in this important range of the sun's spectrum. Previously thesestructures could only be studied by computer model representations. "Thanks to its excellent optical quality, the SUFIinstrument was able to depict the very small magnetic structures with highintensity contrast, while the IMaX instrument simultaneously recorded themagnetic field and the flow velocity of the hot gas in these structures andtheir environment," said Achim Gandorfer, project scientist for SUNRISE atthe Max Planck Institute for Solar System Research in Germany. After completing its mission and separating from its balloon, SUNRISE parachuted safely down to Earth on June 14, landing on SomersetIsland, a large island in Canada's Nunavut Territory situated in the NorthwestPassage, the seaway through the Arctic Ocean between the Atlantic and thePacific. SUNRISE is a collaborative project between the Max PlanckInstitute for Solar System Research in Katlenburg-Lindau and partners in Germany, Spain and the United States.